(a) Pass the washer hose through the No. 3 antenna cord sub-assembly. (b) Pass the No. 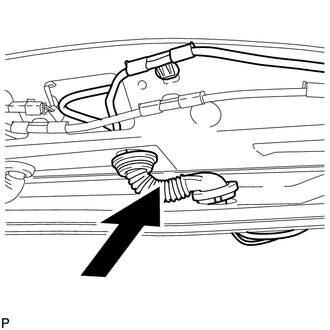 3 antenna cord sub-assembly with washer hose through the vehicle body as shown in the illustration. (c) Engage the 2 claws. (d) Connect the grommet to the back door. (e) Engage the 4 clamps. (f) Connect the connector and engage the clamp. (1) Engage the 7 clamps. 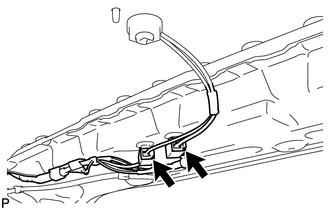 (2) Engage the 4 hooks to connect the washer hose. 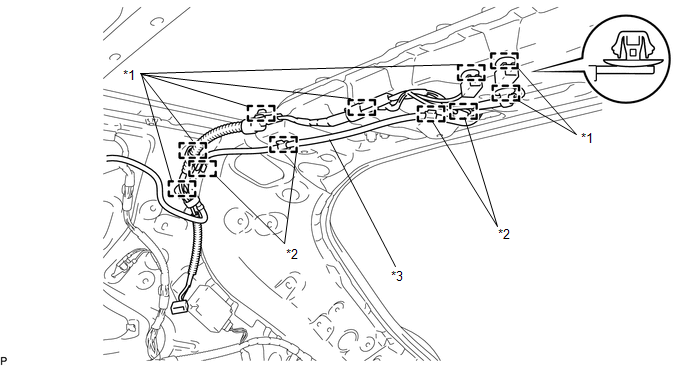 (3) Connect the 2 connectors. (1) Engage the 5 clamps. 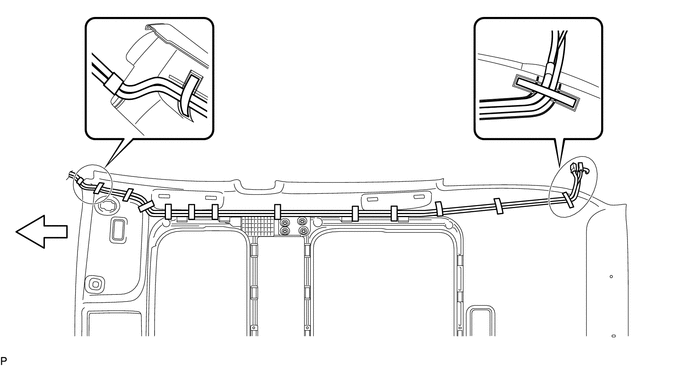 (i) Set the position of the grommet as shown in the illustration. 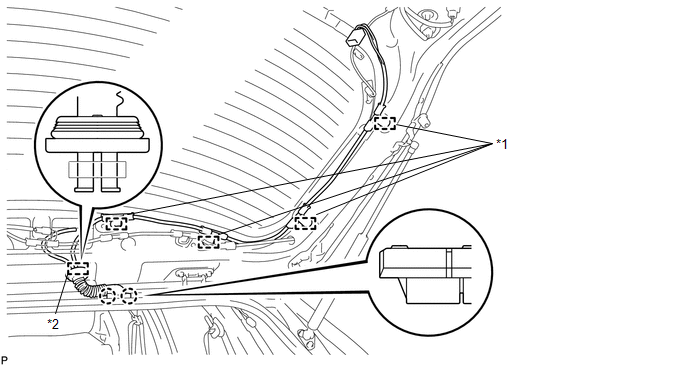 Flat area to be oriented outside the vehicle. (a) Aligning the No. 2 antenna cord sub-assembly and washer hose with the markings on the roof headlining assembly, temporarily install the cord and washer hose. 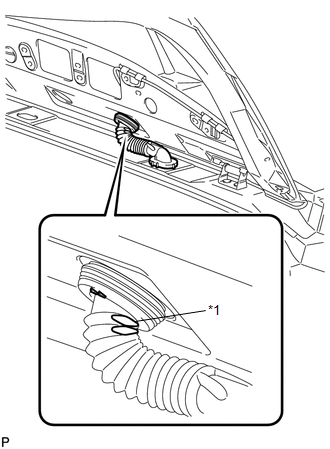 (b) Put the strips of the tape back to the positions shown in the illustration in order to secure the antenna cord and washer hose to the roof headlining assembly. If the tape has lost adhesion, use other tape, such as packing tape, with enough adhesion to secure the antenna cord and washer hose to the roof headlining assembly. 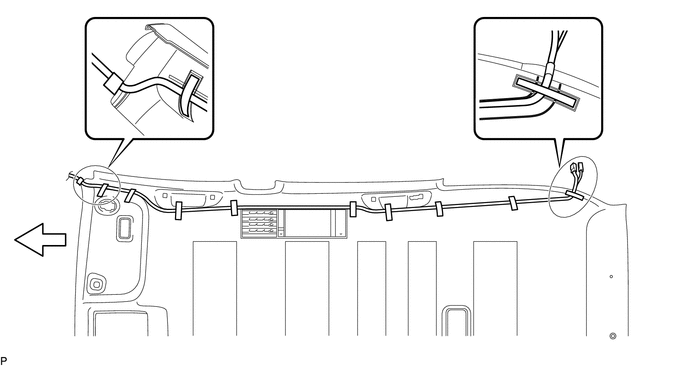 Secure the antenna cord and washer hose to the roof headlining assembly with tape as shown in the illustration. 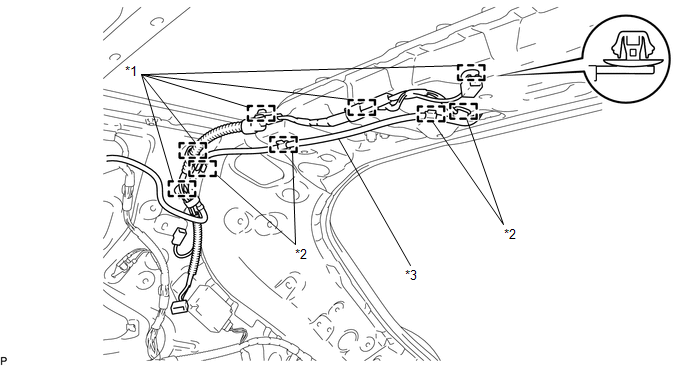 (a) Engage the 7 clamps to install the No. 1 antenna cord sub-assembly.